Hey guys! I'm a little busy celebrating my anniversary with my fiance and I haven't had the time to edit swatch pics, so you're getting something a little different today! I don't know about you guys, but every time I go to KBShimmer's website to check out the polish, I take a detour to check out their handmade soaps. I finally decided to just give them a try! First, I should say that I actually ordered the Spearmint soap, but was mistakenly sent the Peppermint soap because a new employee got a little confused. KBShimmer sent a replacement Spearmint soap and I was allowed to keep the Peppermint soap, so I'll be minty fresh for weeks to come, haha! 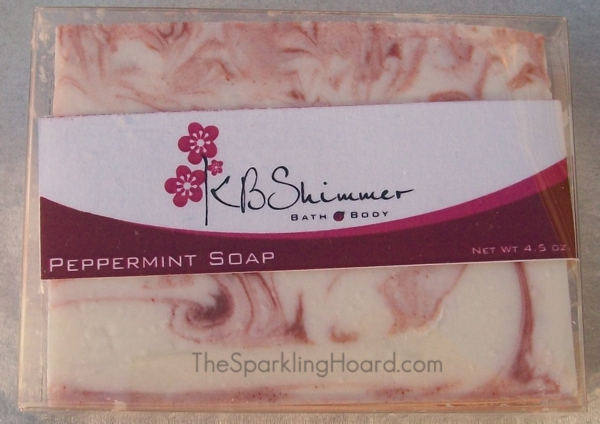 KBShimmer Peppermint Soap features a pretty red and white swirled design. This is a pretty soft soap, and it's very easy to cut it into smaller pieces. It smells just like a candy cane, though I find that once you're in the shower, the candy element of the scent kind of disappears and it just smells straight-up minty. It lathers up nicely and actually makes your skin feel cool and tingly! You should avoid using this soap on sensitive areas, though, since that tingle can become an uncomfortable stinging or burning sensation if the soap is applied to the wrong area. I accidentally got some soap on a scrape I didn't realize I had, and it was a little uncomfortable. Not horrible, but worth noting! The soap was not drying, but it wasn't particularly moisturizing, either...pretty neutral on that front. It left me feeling clean and didn't leave behind any kind of residue or film. I like it a lot! KBShimmer's handmade soaps cost $5.75 for 4.5 oz and can be purchased from KBShimmer's online store. You can stay up-to-date on the latest KBShimmer news by Liking their Facebook page.